Morristown, New Jersey is known as a charming historic community and is nicknamed the “Military Capital of the American Revolution.” The livelihood of downtown Morristown embraces the rich history of this delightful town. As a community that has been known to help out the needy, Morristown residents are often found working in soup kitchens and shelters to assist as many people as possible. This quaint town has a population of just over 18,000 residents, and would be delighted to welcome a few more. Buy a house in Morristown, New Jersey, to experience what it’s like to live in such a warm and thoughtful community that enjoys giving back to others. As Morristown embraces their historic appeal, one of the top attractions of the town is the Ford Mansion from the 18th-century. In addition to history, Morristown has even more to offer, including a serene garden, the Frelinghuysen Arboretum, which is a prime spot for picnics or walks. Get adventurous with 8 miles of scenic trails through the Loantaka Brook or hike through Fort Nonsense and Patriots Path. Not only are there wonderful recreation opportunities here, but residents also enjoy convenient transportation that includes access to the New Jersey Transit and bus. 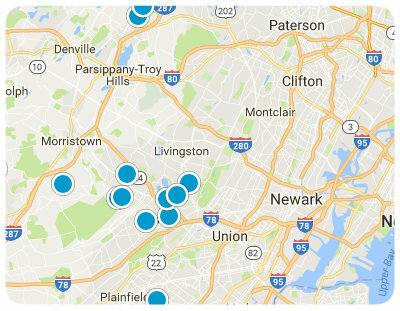 With all of these marvelous amenities and features, Morristown is a wonderful place to buy a home in Northern New Jersey. Homebuyers will be pleased to discover diverse housing options. You can find a charming new starter home or go all in with a large single family home. Condos are also an option in this beautiful town, or depending on your preference, you can purchase a home with 3 or more acres to own a piece of the gorgeous scenery in Morristown. Types of homes commonly found in this town include colonial, farmhouses, townhouses, condos, split level, and cape cod, so no matter what your personal tastes, you are sure to find your dream home here. If you would like to buy a home in Morristown, New Jersey, please do not hesitate to contact us today for assistance or further information. Large storefront with lots of potential.